On Monday, 03/18/19, San Leandro Police officers were dispatched to a downtown paint store regarding a female customer attempting to use a fraudulent credit card. When officers arrived on the scene, they contacted the female who attempted to use the credit card and her male friend, 30 yr-old Daniel Lamar of Oakland. Officers found that Lamar was on probation for a previous firearm violation. During the investigation, officers searched Lamar's vehicle and found a loaded subcompact assault rifle with a "banana" style high capacity magazine. The weapon was loaded with 39 rounds of ammunition. Lamar is a convicted felon with a criminal history in four counties that include Los Angeles, Stanislaus, Sacramento, and Alameda. 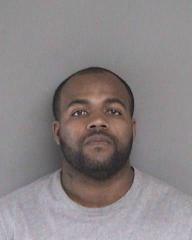 Lamar is currently on probation for a weapons-related arrest last year in Alameda County. "The weapon that was located by our officers is capable of causing serious harm," said San Leandro Police Lieutenant Isaac Benabou. 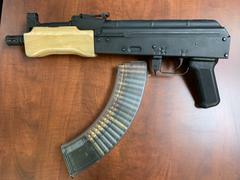 "This is a weapon designed for war, but yet found in the possession of a convicted felon in our community. Thankfully it has been taken out of the hands of a dangerous individual." The Alameda County District Attorney charged Daniel Lamar with three felony crimes and one enhancement charge. Lamar remains in custody at Santa Rita Jail in Dublin and will appear in court later today. The female invloved in the case was not arrested as the business declined to press charges.